Don’t use the karategis anymore. They hang together like ghosts in the closet. Don’t use the obi either. At a 45º angle, the invisible dojo lies over the living room floor. Silently at night in darkness I do the Goju katas as I was taught, in the background Pandora plays selections from the Buddha Bells channel. 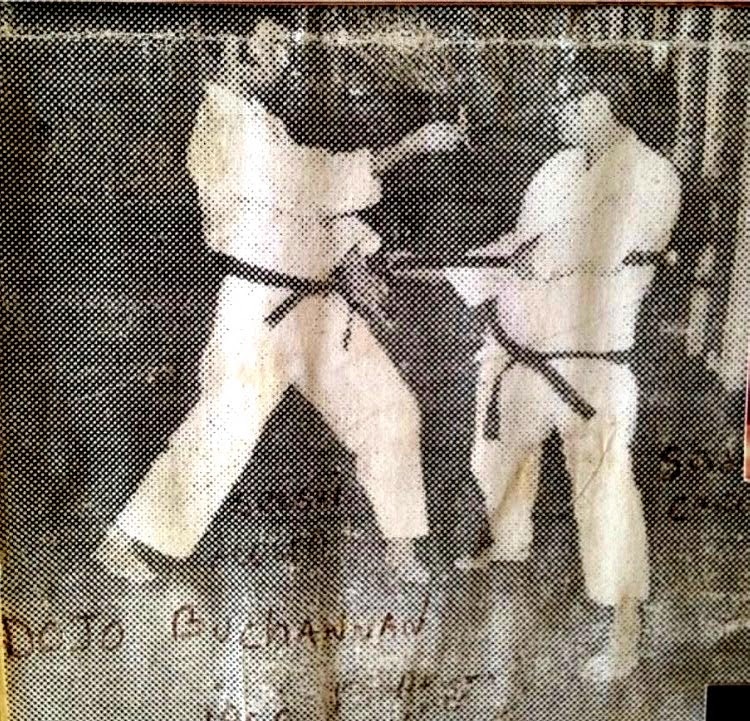 The guy to the left in this old faded photo from the late ‘60’s or early ‘70’s is my last karate sensei long before I knew him, when barely an adolescent, when he practiced Isshinryu karate at a local military base, Buchanan. More than 50 years have passed. Because time does pass. And not in vain. not knowing exactly how. It is all feeling, breathing, and stepping. The music plays on. A faded photo lost to time, barely discernible. Creased and white and threadbare as a sensei’s obi. Sai to neck, cat stance. Sensei Acosta has been practicing karate since his early teens. Last time I saw him in the dojo he was sipping lukewarm green tea and holding his bamboo stick. Last time I saw him on the street he was smoking a sad cigarette and sipping black coffee. He does Thai massage. He gets by. He says he no longer goes to dojo. He says. Mean, motherfucking samurai. Some still practice. Some still go to dojo. Some now have garden dojo like the old Okinawa teachers. All that is fine. Some only sweat when they go to a seminar every two years. Some tell old dojo yarns across a table full of beer bottles. Some look at their old dojo photos and reminisce. All this is fine. Everyone has paid their dues. But Karate goes underground for some. I don’t do kumite anymore. Just the katas like an endless dream. Been years since I touched my toes, ages since I felt a blow. Yet the body moves in tandem with the kata in a darkened room, and somewhere in the pot belly something tenses then relaxes in Sanchin. Practice for that one sure blow or kick. Do the kata of hidden intentions. There is no time for fancy footwork. Laugh at myself as I slip further away from any hope of perfection. The music plays on. _/\_ thank you for sharing your training. Your blog has been sorely missed of late and I do not wish it to end now. At the same time, I recognise that all stories must have a conclusion; I just wish it weren't so in this particular case. Where else shall I find relief from the tedium of soundbites populating the web? By all means, hang up your gi and obi. Just don't hang up your katas. Or your pen. I hope your training continues in its own way and continues to bring value to your life! Wow - almost like a Japanese poem - I was very touched. Please write more. I remember this picture. Jaime Acosta and Eduardo Caro at Fort Buchanan, training under Sensei Best (Isshinryu). Years after this picture was taken they had a fallout over who should run the Dojo. I was there for the whole sad affair. At least Jaime had more integrity than Caro. Sorry to hear that Jaime -or "Jimmy" as some people used to call him- is no longer practicing. Perhaps he found out, like me, that some things are more important in life than Karate. At any rate, this faded photo brings back some pleasant memories, when my world was much simpler. Thanks for your postings, which I have visited occasionally during the years. ...the past is done, for better or worse. We move on, and hopefully forward...with a mindful eye on our past. I do have many, many fond memories of the PR dojos and training with my dojo brothers and sisters there. I just stumbled upon your blog, and found myself reading it all. Well written and touching in a humble way, and I certainly can relate with some of your experiences. Thanks for sharing. I have often visited here for your reflections. I wish you'd write more.